Edmodo is a private microblogging platform developed for use in the classroom by teachers and students. Edmodo provides teachers and students the ability to share notes, links, and files to foster communication inside and outside of the classroom. Teachers also have the ability to post alerts, assignments, and events to share with their students. Currently Edmodo is owned, operated, & funded by Jeff O’Hara & Nic Borg. Jeff is a network administrator/webmaster for Community Unit School District 200 in Wheaton, Illinois. He also blogs at http://blog.zemote.com. Nic is the webmaster/web developer for Kaneland Community Unit School District 302 in Maple Park, Illinois. Here is a screenshot of the page that I created for the students in my Business Management course at heritage College. I normally use email to to update students on assignments, events and makeup assignments which can be tedious especially if your teaching three classes like me. 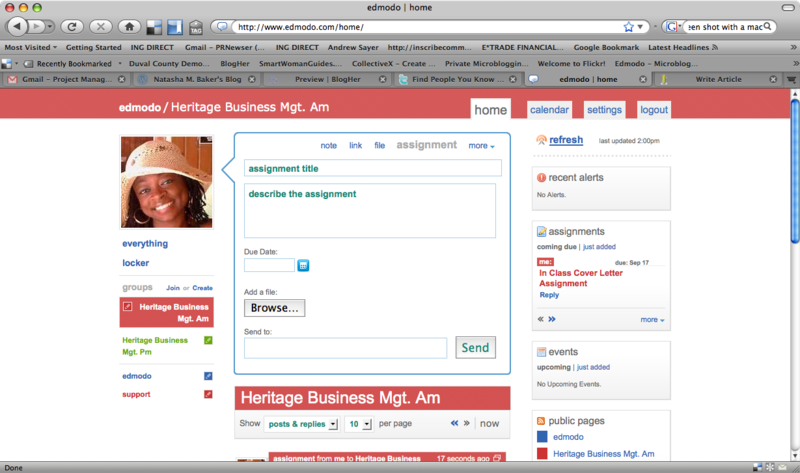 Now, with Edmodo, I only have to post the assignment once and Edmodo will send an alert to all of my students! The best part about Edmodo is that its FREE, so take advantage now. Thanks Jeff and Nic! edmodo is something i think all schools and business should use it is very easy to use and the file sharing system is very quick. This is something i think will be nice to start the 2009 school year off with with all schools and grades using thins system was a very nice experience…. I really like the exsperince with edmodo,i was out for most of the mod due to medical problems and a sugary and if it wasnt for this site i would never of got the assiments i needed and would not have passed the class like i did,i would recomend that all the teachers here at heritige would use this in the future to help there students not fall behinde when they miss. I think that Edmodo is a GREAT tooll for school~! I missed a lot of class and it was great that I could go online and see what assignements I was missing or needed to do. Documents were loaded there, so I had access to them when I needed them, or if i misplaced them. This is an AWESOME tool for school~!~!~ THANK YOU ~!~!~! I personally think edmodo was a great thing, even though i didn’t miss much school, still its great to know and be able to get on there and get the information whenever i needed it. Thank-you! !